How many Parisian travel guides does one household need? That’s the question I asked myself recently as I unwrapped our autographed copy of Don’t Be A Tourist In Paris – The Messy Nessy Chic Guide. Given the fact that our home already contains plenty of guide books, my intuition tells me that the answer to that query will always be ‘just one more’. However, there was never any doubt that we would be purchasing Messy Nessy’s first book. Scott and I have both been avid readers of the website Messy Nessy Chic for years now. Far from your typical French inspiration, Nessy provides a view of Paris (and other interesting destinations) that is both quirky and intriguing. Many of our own Parisian adventures have been influenced by her writings, from our investigations of La Petite Ceinture (the Little Belt) to our dining experience at La Gare. 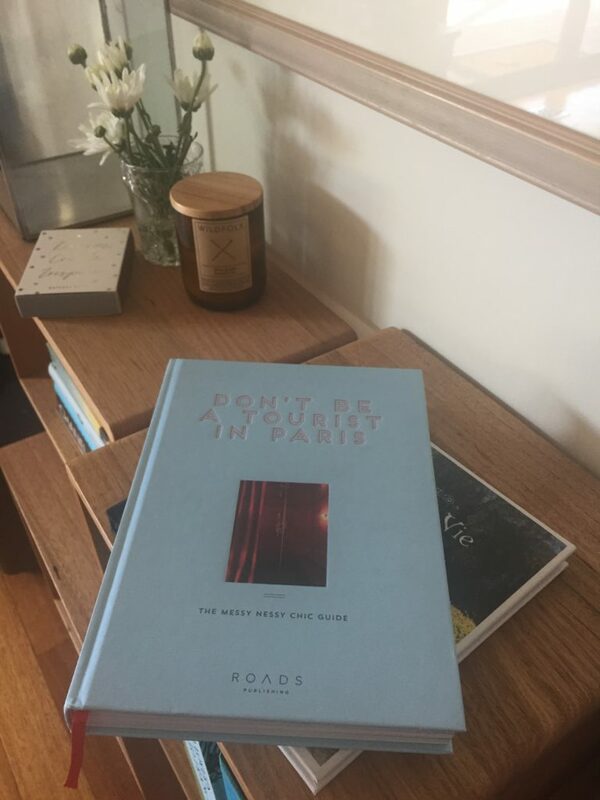 And if you’d like to experience Paris in a non-touristy way, you should definitely get your hands on a copy of Don’t Be A Tourist In Paris. Author: Vanessa Grall, better known as Messy Nessy. Published: 2017 by ROADS Publishing, Hardcover, 255 pages. The quirkiness of it all. This book provides a behind the scenes look at Paris. While it doesn’t completely avoid all tourist activities, it certainly has a heavy weighting towards the everyday, gritty Paris as opposed to the postcard version. The concept. Each chapter is based on a question that a Messy Nessy Chic reader has emailed in. Taking this approach means that the book is not laid out like more traditional guide books. Instead each section of the book offers a full taste of Paris, whether that be restaurants, bars, accommodation or sights. The photographs that grace the pages. We all know that I’m a sucker for a good shot of Paris. And there are some absolute winners included in this book. The cover design/art. I’m not sure that the cover does the inside of this book justice, especially when you consider the number of fabulous photos the book contains. But it does go along way to proving the old adage that you can’t judge a book by its cover. So if you are like me and find the cover less than appealing, please don’t let that stop you from having a peek inside. Are you a guide book fan? Have you read Don’t Be A Tourist In Paris? What did you think of it? I’d love for you to share your thoughts in the comments section below. P.S. If you are keen to check out some more of my reading recommendations, make sure you click through to the Distant Francophile Book Shelf. Please note: This is an unsolicited post and no compensation of any kind has been received from Vanessa Grall, Messy Nessy Chic, ROADS Publishing, associated publishers or distributors. Looking for more French inspiration? 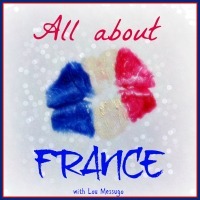 Then don’t miss the #AllAboutFrance Linkup over at the Lou Messugo Blog. Click this link and you’ll discover a diverse range of blog posts all about France. To return the favor of your review of MNChic, I will suggest Quiet Corners of Paris by Jean-Christophe Napias. It is a small square book with beautiful photographs, and it immediately got a 5 star rating from me because it did not ignore my beloved 20th arrondissement! Unless you know Paris EXTREMELY well (and even if you do), I guarantee a number of delightful discoveries suitable for any season of the year in places you would otherwise walk right by. If you are a Messy Nessy fan you will really enjoy this new book Alisa. Thank you for the tip on Quiet Corners…I’m off right now to investigate!! !